One thing, don’t for a moment think that games are a wonderfully peaceful event, where children sit around a coffee table playing on a rainy afternoon, while eating freshly baked cookies… The reality, is a little chaotic and a fair taste of insanity, in fact downright unpleasant unless I join in!!! Which is why games are so special, we all enjoy it… I stop what I am doing to play and the kids have my full attention… this is not the time for everyone to do their own creative thing… this requires concentrated effort for everyone to play along together. 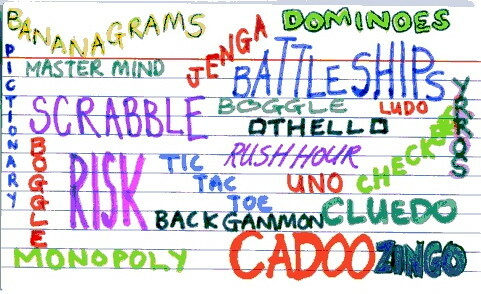 This post is a list of twenty-four games that our family have tried and tested and enjoyed… hope you enjoy them too!!! 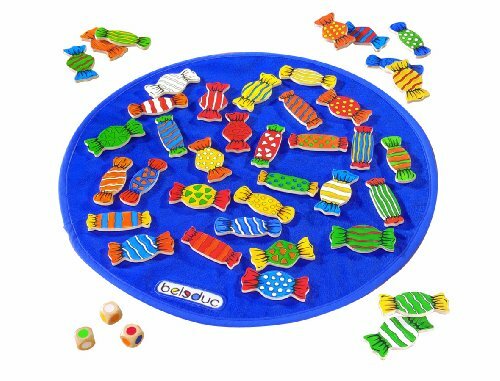 Cadoo has to be our favourite family game ever – everybody loves it… all of us from grandparents to toddlers love this game. 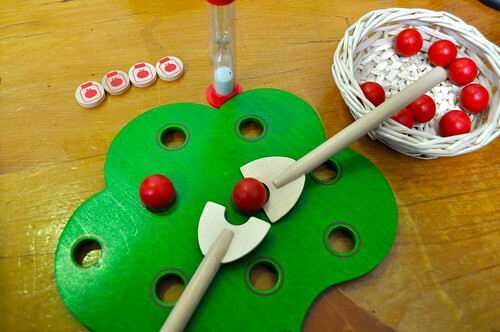 The players have a number of timed challenges: They either have to model play do, act out, draw or puzzle it out. 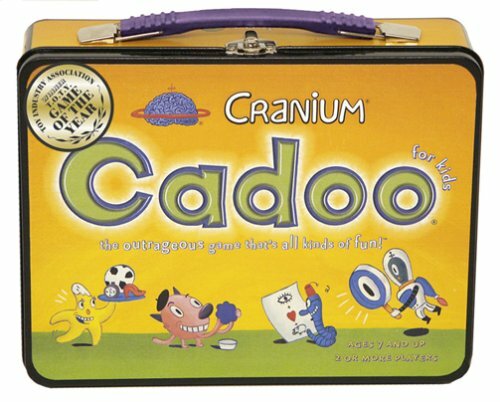 This game can get hysterically funny and have folk on the edge of their seats… There is a more grown-up version, Cranium, but as a family we prefer Cadoo the games are quicker and the challengers a lot more fun. 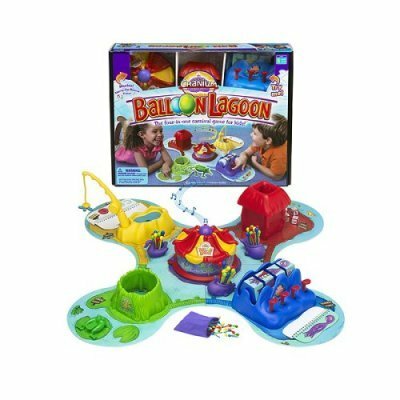 Balloon Lagoon is another great game from the Cranium Family, it is a junior version of cadoo – with four challenges: magnetic letters, jump the frogs, line the picture up and matching snacks. 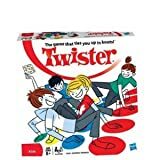 I thought this game was a bit young for my kids – but the proof is in the playing and they all play together… games are quick about fifteen minutes and they play over and over and over again!!! Beleduc Sweet Treats is a colour matching game for younger children… you throw the coloured dice and gather up the sweeties that have the same colours as the dice on them… who doesn’t want to collect candy!!! I have to say my girls all love this game and will play it a lot, and the boys – not so much… just saying!!! 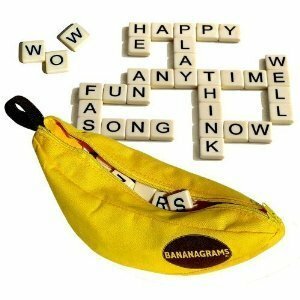 Bananagrams and Appleletters: these two games are very similar and we love them… this is definitely a time for little folk to team up with an older sibling, as soon as my kids can sound out words they join in… spelling may be a little unconventional but it works and these are games that my kids could play every single day without question. 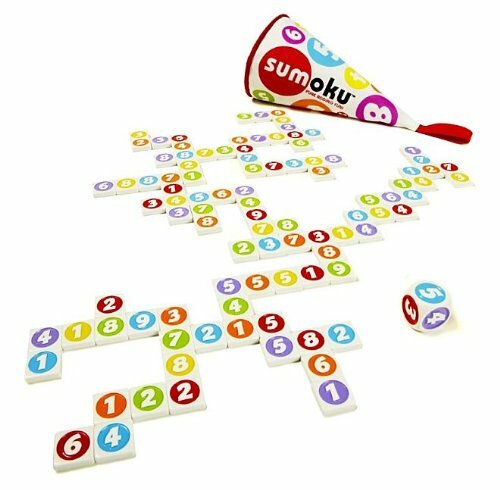 Sumoku: Is another numerical game that doesn’t feel like you are doing math. You have to construct a numerical crossword, where each line is a multiple of the number thrown on the dice. 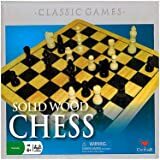 Easy even for beginner mathematicians to put something on the table, but quite challenging for players that are trying to use up all their pieces!!! This is a game collection from Alex Toys and my kids love it, it hangs on our kitchen wall… and contains: checkers; snakes and ladders; Tic Tac Toe; Backgammon and Mancala. All the pieces are those nice spongy – “Alex Toy Pieces” – fabulous bright kid appeal and hard to break or lose!!! It is the easiest thing in the world to teach your kids a couple of card games and just have a pack of cards on hand wherever you are… permanent entertainment!!! Snap: Let’s begin with the easiest card game!!! Even little folk will love it!!! 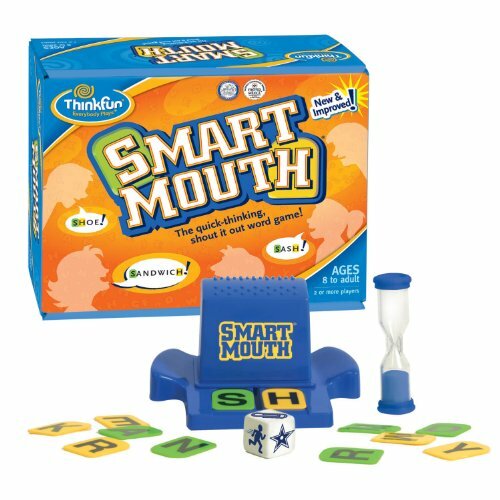 A game for two players. Divide the cards equally amongst the players. Place the piles of cards face down in front of the players. Together turn the cards over… if the cards don’t match numerically play again. If the cards match then the first player to shout snap wins the pot of cards in the centre. If the cards don’t match and a player shouts snap… there is no reward. The player to win all the cards is the victor. Rummy: If your kids can play rummy then it is easy to teach them any number of other card games. Shuffle the cards and deal se7en cards to each player. The remaining cards are placed face down in the centre and one card turned upwards… to begin the discard pile. 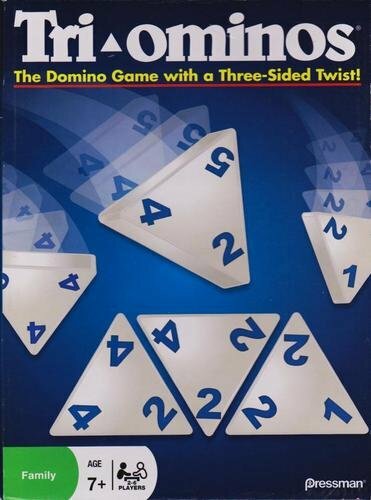 Each player tries to make groups of three or more cards… three or four of a kind of card or a string of sequential cards from the same family. When it is your turn you may place any groups you have on the table and either collect a card from the pile and discard a card from your hand or pick up the top discard card if it will help you form a group. 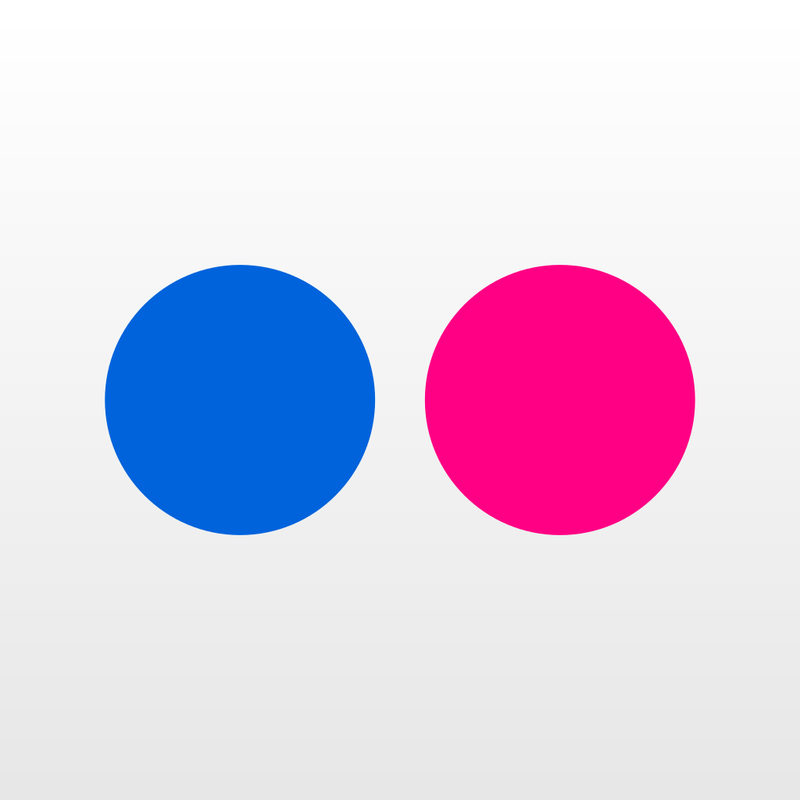 You may also add a card in your hand to any groups on the table if it fits. The first person to be rid of all the cards in their hand wins. Divide the cards equally amongst the players… and placed in a pile face down in front of each player. For a round: each player turns the top card over and the player with the highest card value wins the cards. If the winning cards are equal then there is “WAR” the opponents place three cards face down next to the matching cards. Then they turn the next card up… and the winning card “wins” the round. As soon as a player is out of cards they are out of the game. Shuffle the cards and deal se7en to each player. Place the remaining cards in the middle of the players. The aim is to find pairs of cards… so the players first check if they have pairs of cards in their hands. Place any pairs on the table in front of them. Then the game begins for real… the player asks any other player if they have a card that would make a pair with the card in their hand. 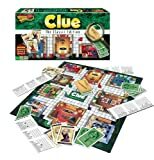 If that player does have the required card then the player places the pair on the table and has another turn. 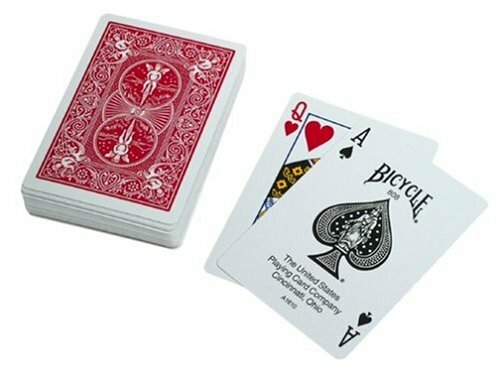 If the person they ask does not have the card then they “Go Fish” and add a card from the centre to their hand and the next person takes a turn. the game is over when all players have no cards and then they count the piles of pairs in front of them. The player with the most pairs wins. Crazy Eights: A fast furious game that can be played again and again and again… without pause!!! Shuffle and deal each player se7en cards. Put the remaining cards in the centre and turn over the top card to start the discard pile. Players need to look at their own cards. The player must place a card either of the same value or of the same suit on the pile. If a player doesn’t have a card to place then he may place an eight on the pile and announce the suit they want in play. If the player doesn’t have an eight either then they must draw a card from the pile until they have a card they can play. The player to discard all their cards first is the winner. Spoons: Another game that tosses the “quiet game of cards” idea out of the window… this is loud fast and fun. Players sit in a circle with a pile of spoons in the centre… one less spoon than the number of players. Each player is dealt four cards… and the rest placed face down in the middle. The player collects a card. If it improves the hand then the player keeps it otherwise they pass the card onto the player on their left. The player on the left does the same… the game naturally speeds up and cards start passing furiously. The first player to collect four of a kind quietly takes a spoon. When the other players notice they quickly grab a spoon. The player without a spoon is eliminated… after a couple of rounds their will be one remaining champion. Deal the card equally into face down piles in front of each player. 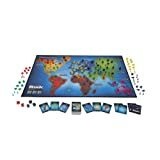 Each player takes a turn to quickly place their card face up in the middle of the game. If the card is a Jack then everyone quickly slaps their hand down on the jack… the player who slaps the jack first wins the whole pile of cards. If a player slaps the wrong card then they must forfeit a card to the player that placed that card on the pile. If a player loses all their cards they may play out the round and if they manage to “slap Jack” and win the pile they may continue to play – if they don’t they are out of the game. 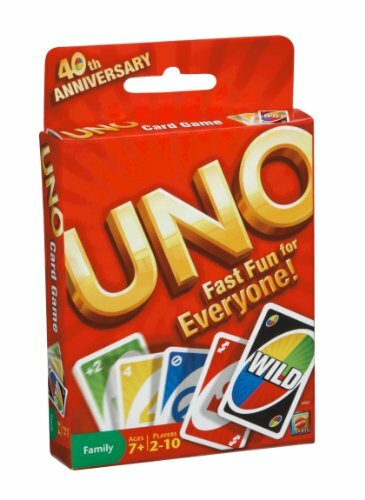 Uno Card Game: By far our family’s favourite card game. Everyone loves and adores this game and we can play it for hours and hours and hours… it is simple, it is fast and it is fun… what more do you need!!! I have to add that I have recently found a collection of games that even really young children can play and have a heap of fun with… Beleduc games… We have tried Candy that we mentioned above; Torreta, which is a balancing, colour matching game and fun; Pomelo is a game that requires gathering skills… they have to collect the apples off the tree and place them in a basket, when the timer is finished they gat a little jar of jam for each apple… very sweet and lovely – very popular with all my girls; and finally Captain Kidd a pirate matching colours and treasures kind of game – requires matching skills and memory… my youngest five loved this!!! 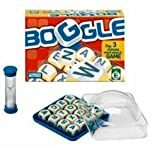 We have been able get Beleduc Games locally at one of our favourite toy stores: ELE Toys, we have blogged about this fabulous toy store, ELE Toys before… They lent us a couple of these games to try out and our kids really enjoyed them!!! That’s it… a collection of games… You are welcome to share some games you love playing… we love trying out new ones… In fact I have a couple stacked away in the cupboard that we need to try out still… and we could probably write a whole new game post after we have tried them all out. 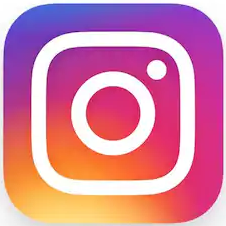 This post is not a sponsored post. All but two of the games we have owned for a couple of years, we are simply showing you our favourite games from our game shelf. 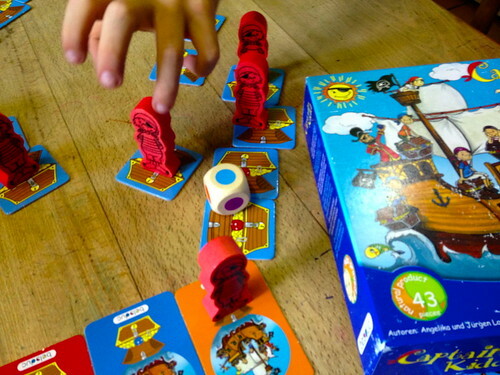 Ele-Toys lent us two of the games: Captain Kidd and Pomelo to try out for this post. 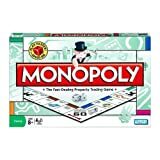 The links to the games are affiliate links, which means if you do decide to buy them from Amazon we will earn a small fraction of the amount… Don’t feel compelled to shop at Amazon, though if there is a game you are interested in then it is a great place to read reviews and see if other folk have enjoyed the game too. Awesome! 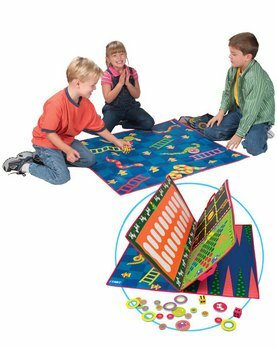 Table top (and floor) games are a lot of fun. You have listed some really good ones :). Have you tried Settlers of Catan? Great strategy game. Base set is for four players, but you get an extension set for two more. It is also available as Kids of Catan for younger players and a mini dice game to play when you are on the move. Mary’s suggestion of Settlers of Catan reminded me of our family’s current favorite game: Ticket to Ride. 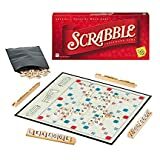 Like Settlers of Catan, it probably isn’t for the very youngest of your brood, but it is fun for older people! Thanks Jonathan, Games are fun indeed!!! Have a good week. Hay Mary, We haven’t discovered Settlers of Catan, thanks for the tip – we will have to look out for it now!!! Hope you have a fabulous weekend!!! Hay Brenda, Thanks for the tip – I am off to track it down and have a look right now!! !